I don’t know about you, but every day the sun is shining and it’s not freezing outside, I long to work in my yard. My husband and my neighbors are probably all rolling their eyes to see me outside already, but there is so much I can do! I am cutting pussywillows every day. I wait until they are fully opened on the stems; when I bring them in the house, I display them in a vase without water. If they are put in water, they will continue to develop and flower. Displayed dried that will last all spring. I am hoping to twist up a few pussywillow wreaths in the next week for our grand re-opening on the first day of spring. I make them right outside in the garden using the supple, easy-to-manipulate branches of three varieties of pussywillows. Pruning is one of the most important chores in my yard right now. Last weekend I pruned my peach tree. Fruit trees should be pruned in the winter, before the sap starts to flow. Each fruit tree is pruned a bit differently. 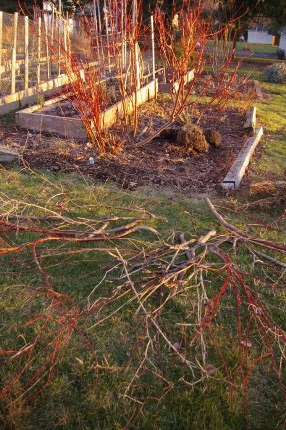 The old wood of my variegated redtwig dogwood is lying on the ground. I cut out the old, woody stems and left the young, bright red wood. Not everything should be pruned now. Spring blooming shrubs have their flower buds set up on last year’s wood and shouldn’t be pruned until June. Summer blooming hydrangeas should be left until the buds start to swell in April. Summer and fall blooming shrubs are a different story. You can begin shaping your rose of Sharon trees, mimosas, and Heptacodiums in March. Callicarpas (beauty berry bushes) need a good cut back to encourage lots of new wood that will produce a good berry set. I cut all of the old wood out of my variegated redtwig dogwood on Monday. It needed it desperately. The older trunks are no longer red, they are covered with brown bark. I remove them as close to ground level as I could, and then I tipped the young wood that remained to encourage lots and lots of fresh, young, colorful growth. Epimediums whose leaves remained up over the winter need to be cleaned up now. The delicate flowers of this durable shade plant emerge quite early in the spring. If you don’t cut the old foliage off in late winter, it will really slow you down to try and snip between the thousands of flower stalks in early May. My Hellebores are blooming or budded already. Even though we consider their leaves “evergreen”, they look quite bedraggled by the time winter ends. I cut the old foliage off to the base, thus allowing the beautiful flowers to take center stage. The new leaves will emerge in April and will then add deep, dark green foliage structure to your garden for the next year. 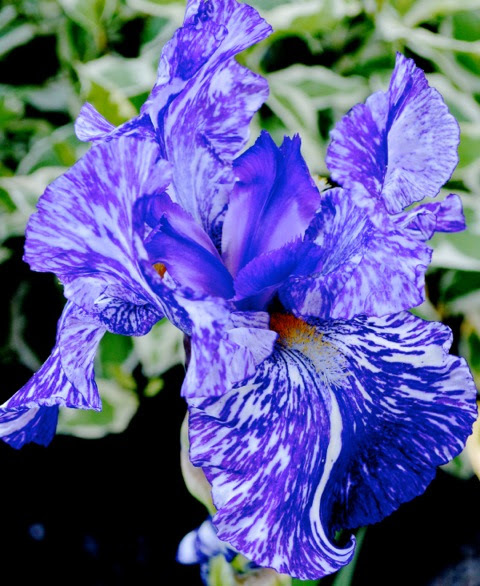 Remove all of last year_s bearded iris leaves and discard it to keep your iris patch free of borers. Last Monday I took a garbage bag and my garden sickle and went around to all of my beds looking for bearded Iris foliage. Any that I found was cut to the base and tossed in the garbage. Why? Because the Iris borer lays its eggs on bearded (German) iris foliage in late fall. If you don’t get rid of it, the larvae hatch on the old leaves and tunnel down into the rhizome and eat it from the inside out, decimating your iris patch. I opened my back garage door and checked on my 7 hardy fig trees that have spent the winter there. They look fabulous. I watered them lightly and let them get a bit of air and light for the afternoon while I worked in the yard. They appreciated that! I cut branches of forsythia and brought it in the house to force in a vase of water. I only have one forsythia and I have it simply because I like to force the branches RIGHT NOW! I went around and looked for broken branches on my plants. With the extreme wind we had last week, I had quite a bit of remedial pruning to do. A winter like we are having, with alternating freezing and thawing cycles, causes plants to heave up out of the ground along with their labels. I reset a lot of perennials last weekend, especially the ones I planted late last fall. They look fine, but I am glad I noticed they had some of their roots exposed. 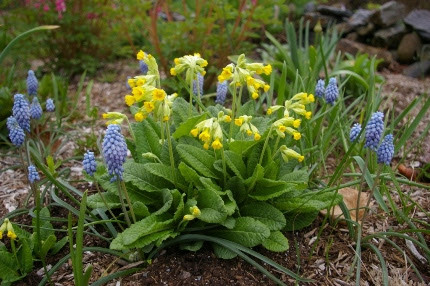 I was surprised to see that the crowns of my hardy primroses are poking their leaves up through the soil already. Everywhere I look, I see signs of life. The grape hyacinth leaves have been up all winter; I combed them out to make room for the flower buds to emerge. In a few months, the beautiful scene in the photo above will once again return to my garden. Spring is around the corner and I am thrilled!